You have heard of the phrase that boys/girls just want to have fun. Well, guess what – in the 21st century, even robots, too, would like to have their fair share of fun. Having said that, anyone who has observed children would know that the little ones have boundless levels of energy, and it can get pretty difficult in trying to keep up with them. Robots like the £139.99 Parrot Jumping Sumo is one boisterous jumping robot that is controlled using your smartphone. Yeah, I know right, there’s an app for that and all that jazz. 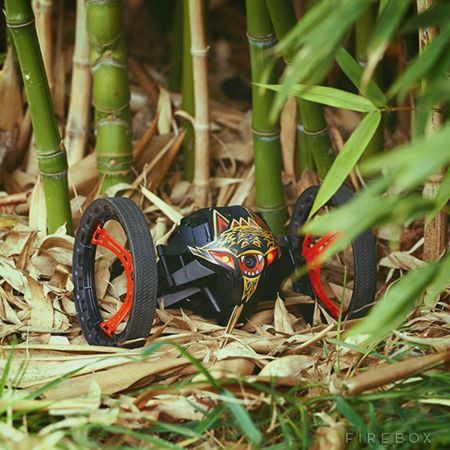 The Parrot Jumping Sumo comes across as a highly advanced robot that will carry with it a wide-angle camera. This camera is capable of streaming video feeds to your smartphone, not to mention record all that is going on around. Be prepared to get dizzy as it jumps up to heights of 80cm as well as a similar length, while recording all that the wide-angle camera sees. Not only that, it is also lightweight and with all of that jumping that goes on, it too needs to be extremely robust so that it can survive both indoor as well as outdoor (ab)use. Scurrying around at speeds of up to 2m/s (7km/h), the Parrot Jumping Sumo is also capable of pushing objects and balancing by itself. This is an interesting addition to other Parrot releases like the Rolling Spider Mini Drone.